If you’re about to jump off that cliff, what happens when you look down? What I write today is what what I’m not supposed to say. A landmark Supreme court case recently ruled about one of the most controversial things in the developed world even today. Next to Euthanasia, it is still potentially the most highly-charged subject (excluding gun control, of course). It divides dinner parties, it separates women and highly-held opinions about mothering, child-bearing or the right to lack thereof and polarizes those with genderized images of femme fatales, love/marriage and having children. 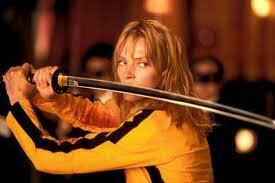 Beatrix Kiddo goes on a “rampage of revenge” when her so-called friends are responsible for attempting to kill her and the child she carried. In popular culture, certain 90s films dictated possible dealings with the choice of having a child as a teenager (i.e. Singles) but generally we tiptoe around the subject in Hollywood. Other liberal countries like France don’t often give it a second thought, but conservative ones like Ireland advocate the right to life over right to women’s choice. Yes, even in 2014. While it isn’t a subject two sides usually can persuade in a political forum (Ask any republican/democrat debate on the subject… ) what is often forgotten is that the individual choice is the one that matters. Now while this decision did not change U.S. laws on the subject it did make a case that a Massachussetts law preventing anyone from standing within a 35-foot buffer zone of an abortion clinic was ruled unconstitutional. The case decision recognizes people as agents of change. Autonomy. What does a woman feel before she makes that all-important choice? No one pretends that it isn’t a bit like taking a dive into deep waters, but we try to ignore it if we can. Autonomy in these kinds of decisions is remembered but not often discussed at least not in the circles I run. The only honest discussion I ever had was with a roommate when we lived with another college acquaintance. When the subject came up, we both still kept hushed voices even though it was 7:00 am and there was no one around. Now I know that this isn’t what women’s rights activists want to hear. They’ll say it was her right to choose what the best thing was for her body and she made the decision to protect her right to freedom. What is forgotten in this conversation is that the choice itself is not just a difficult one at the time. In fact, like many difficult decisions, they often come back to visit us years later. Whether Emily’s choice is ultimately one she will respect as her college self versus the adult self she is today, I will probably never know. I don’t know where she is but I presume there are many ‘Emily’s out there. Why do I think so? Another conversation I had with a friend , [Jane] who confessed she’d been lost for almost 12 months because of the same decision she made. Then she spontaneously burst into tears over a secret heartache no one knew about. Only this woman was closer to 30. It seems the choice doesn’t get easier no matter the age. So when I read this article today about “The Last Person You See Before Getting an Abortion,” it allowed me to ponder the ramifications of such decisions. The Supreme court (SC) ruled unanimously that there should not be a buffer zone around Planned Parenhood and other such clinics to detract those who seek to make a statement. So, Roberts and Scalia made the case that when people speak to others in a polite, non-threatening way, some people were actually persuaded not to have abortions. That certainly is news. The fact that the decision was ruled unanimously also tells us something about how convincing the argument was. The reason this made me think of Emily, Jane, and countless other women who may have had to face this kind of decision is simple. It is that it underlines a fact we ignore. That the choice is an emotionally-charged one and recognizing that may be something. In a continent like Africa, where 6.4 million abortion occurred in 2008, only 3% were performed under safe conditions. By unsafe, WHO defines this as performing a procedure by a person with the lack of mandated skills or qualifications or an environment where the minimum standards of hygiene and/or medical skills are kept. Mozambique, as an example of one of 18 African countries where abortions are legal if the woman’s physical health is at stake. Abortion is not permitted under any circumstance in 14 additional African countries. As it stands, this isn’t stopping women from choosing to do so. The average is 29 abortions per 1,000 women. As stated earlier, most of these are not remotely safe. So living on a continent with limited access to such procedures and opportunities, I realized all over again what a gift it is for people to choose. To choose to say yes. To choose to say no. To change one’s mind. To listen. To make a decision knowing she will stay healthy (and wake up) after going under the knife. Or stay healthy whether she says yes. Or no. The Bride makes her final stand against one-time close friend, O’ren Ishii in Wintery Japan. Or to decide like The Bride that slicing and dicing your old bosom buddies and team players is necessary for anyone who tries to take that decision away from her. Kiddo may have a point. Just saying. Previous PostWhy do we call it the world’s sport? Why do we call it the ‘beautiful sport’..?Next PostTime…the heart of Mozambique? You made a good point: “The individual choice is the one that matters”. Anti-abortion (pro-life) and pro-abortion (pro-choice) folks often engage in false dichotomy. Interestingly enough – the SC ruling was more about the ‘quiet’ protest which included standing or going up to women and asking them about their decisions rather than screaming, yelling and jamming signs in people’s faces… it got me thinking how often ‘approach’ – specifically kindness in my humble opinion, makes a difference or “could” make a difference. But women have the CHOICE either way. I agree. This is also true in Evangelism. I’m not definitely as kind as I should be especially when I talk to someone I disagree with. Tire swing outside the small watering hole at Kwalala. Places I like to go - Ireland. Enter your email to subscribe to Vesper's adventure. No great mind has ever existed without a touch of madness. Vesper writes from a perspective of both wanderlust and misfit explorer. This blog is meant to inspire, create laughter and bring some wit into the marketplace of ideas.